Postpartum depression is the most common complication of childbirth, affecting about 1 in 9 women.5 Adolescents are also at high risk. In 2013, 30 percent of U.S. high school students reported symptoms of depression in the past year. Of students diagnosed with a major depressive episode, more than six in 10 did not receive treatment. Recognizing these challenges, community health plans have taken steps to expand screening and access to behavioral health treatment. 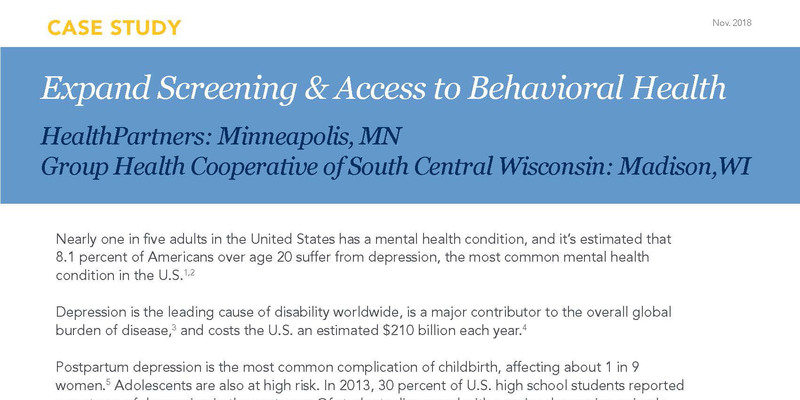 HealthPartners developed strategies to engage patients and increase depression screening in primary care clinics for certain high-risk populations, including post-partum women, adolescents and seniors. Group Health Cooperative of South Central Wisconsin (GHC-SCW), acknowledging the strong relationship between mental and physical health, integrated behavioral health consultants into its primary care clinics to improve health outcomes. To better identify women with post-partum depression, HealthPartners screens new moms whenever and wherever they show up in the care system, including at their baby’s early checkups or a post-partum visit with their Ob/Gyn. Clinicians administer the 10-question Edinburgh Postnatal Depression Scale (EPDS), and a care coordinator follows up — immediately if necessary — with patients whose scores indicate risk. 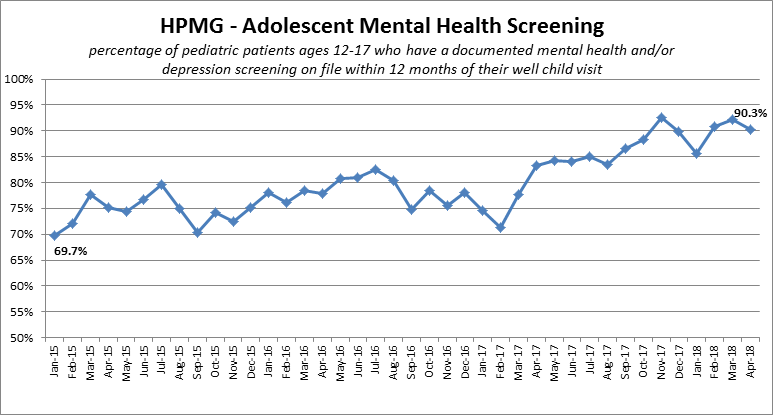 During well visits, adolescents are screened for depression and anxiety using nationally established, age-appropriate tools. The same is true for seniors during their annual Medicare wellness visit. Clinicians meeting with senior patients screen using the Patient Health Questionnaire-2 (PHQ-2) and, if necessary, the more in-depth PHQ-9. Primary care physicians follow up when screenings indicate a need, and/or refer patients to behavioral health specialists for additional care. Reminders and prompts for these screenings appear in the patient’s electronic medical record. Workflows on how to identify and support patients with depression are also available for physicians’ use. Plans are in place to add depression screening to all adult preventive visits in late 2018. HealthPartners patients who are diagnosed with depression are automatically enrolled in an educational and support program called “On Your Way.” The goals of the program are to better members’ understanding of depression, boost participation in self-management and increase the number of members who stay on antidepressant medication for at least six months. HealthPartners members also have access to an online tool for learning new ways to manage stress, anxiety and mild depression. Called “Beating the Blues,” this evidence-based program offers eight 30-minute sessions aimed at helping users build skills in emotional resiliency. The program has been shown to improve wellbeing and life satisfaction. In 2012, GHC-SCW clinical and health plan leaders tested a model of integration called Primary Care Behavioral Health (PCBH), which embeds behavioral health consultants in clinic primary care teams. The health plan recruited a behavioral health provider from a contracted, federally qualified health center who had experience with the model to work one day a week in the office of a primary care champion willing to pilot the program. With guidance from an implementation team that included primary care representatives, behavioral health clinicians, and staff from informational services, coding, billing/claims, reception/scheduling, and health information, the PCBH model was implemented and evaluated. Staff used plan-do-study-act improvement cycles to iron out wrinkles, such as how to share space and staff and how to code a visit in which a patient sees both the primary care physician and the behavioral health specialist. A primary care physician who identifies a patient who could benefit from a visit with a behavioral health professional can usually arrange for an immediate visit if the patient is willing. Primary Care Behavioral Health providers keep about half their day open for unscheduled consults with primary care physicians or visits with patients. Often the behavioral health provider will simply meet with the patient in the same exam room where the primary care physician just saw them. This “warm handoff” from the primary doctor to the behavioral health specialist eliminates common barriers that can prevent patients from seeking follow-up care from a therapist, including inconvenience, apprehension, difficulty navigating the system, affordability, and/or the stigma of making an appointment with a mental health professional. By fall 2013, primary care and behavioral health clinicians began to collaborate more effectively, and both physician and patient satisfaction began to climb. Word spread, and other primary care physicians expressed interest in testing the model in their clinics. The health plan’s 2018 goal is to staff all four of its major clinics at 80 percent or higher for behavioral health. To help primary care providers gain more competency and confidence with behavioral health care, GHC-SCW held training sessions for all primary care staff on motivational interviewing, having conversations about drug and alcohol use, introducing the PHQ-9 form to screen for depression and orchestrating a “warm handoff” to an onsite behavioral health provider. Physicians have also received training on managing medication-assisted treatment for patients with addictions. GHC-SCW scores a 5.0 on HEDIS’ 5-point scale for helping adult patients adhere to anti-depressant medication for 12 weeks after diagnosis. Moreover, primary care physicians felt significantly more satisfied with behavioral health care resources and their own effectiveness after the PCBH model was introduced. 1. “Mental Illness.” National Institute of Mental Health. Accessed November 13, 2018. https://www.nimh.nih.gov/health/statistics/mental-illness.shtml. Eugene Washington PCORI Engagement Award (4109-ACHPF). of the Patient-Centered Outcomes Research Institute® (PCORI®), its Board of Governors or Methodology Committee.